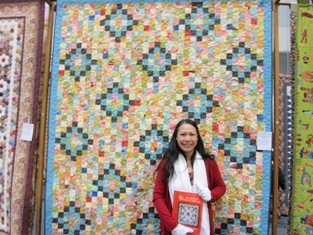 I was a volunteer 'white glove lady' during the first morning of the Sydney Quilt Show, this morning. 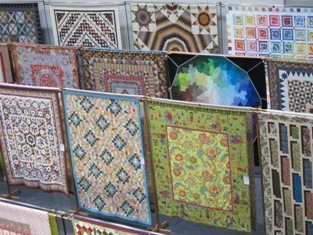 It was also a good chance for me to see my Show quilt hung there. 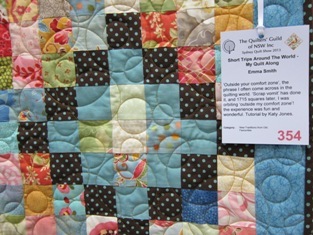 I'm just happy to see my quilt at the Show, among other wonderful quilts. 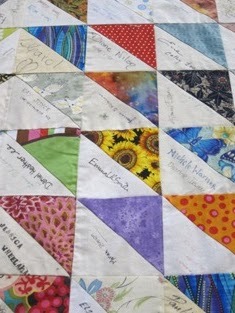 I have also seen my signature half-square triangle block (sunflower), in the Guild's coverlet. 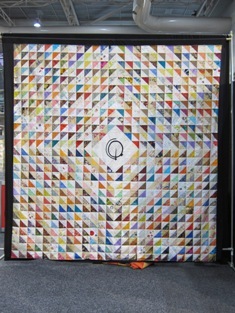 I made the block to join the Guild's 30 years celebration.... I didn't know that today was a very wet day until I was coming home in the afternoon. I guess the weather was preparing me for Seattle, WA. I'm going to be there for work on Friday, so am off packing my bag now.!! 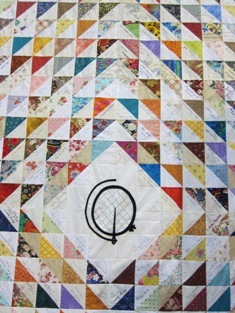 Well done Emma, you're quilt is lovely. Have a nice time away. Thanks, Susan. The trip was successful and I'm back home today.